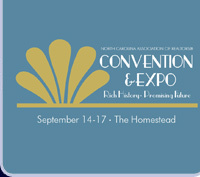 Convention is one of the most cost-efficient educational tools available to members. We work hard to bring you high-quality, national speakers to help you thrive as a successful real estate professional. This year, we have several exciting new sessions that will help improve your business and your workday! Learn about new technology that can increase your productivity at work. Explore new ways to generate leads, grow sales and gain customer loyalty! With many more topics ranging from marketing, communication, stress reduction, and real estate investments, the 2014 Convention & Expo is one event you cannot afford to miss! Attend the 2014 NC REALTORS® Convention and Expo to share ideas, make contacts and develop a profitable referral network with the most successful REALTORS® in N.C. There’s no better place to develop profitable business relationships than Hot Springs, VA, the location of this year's Convention and Expo. The grand old resort located in the Alleghany Mountains of Virginia, The Homestead provides the perfect setting for education, entertainment and networking. During the day, connect with REALTORS® at the Convention’s various educational opportunities. And when the sun goes down, network with REALTORS® at the beautiful Omni Homestead Resort. What are Convention’s main networking events/opportunities? Expo: Make business contacts at one of the largest expos in the Southeast. Education Sessions: Meet REALTORS® who share your interests and talents. Additional Activities: Register for one of the many exciting outings to see the best of what Hot Springs has to offer. Click here for more information about registration fees. The 2014 Expo brings together REALTORS® who are looking for the latest products and services to help them succeed. Join your colleagues to learn about the hottest products and services in the marketplace today! Why do I need to visit the Expo? What can I expect to take away from the Expo? Close more deals and earn more money!